DESK-V103E from VIVO is the perfect piece to your standing desk station, allowing you to find that much needed healthy balance of sitting and standing throughout the long work day. DESK-V103E has a lift mechanism driven by hidden-drive internal multi-motors for an adjustable desk frame only and requires a separate purchase of a tabletop with a recommended length of 40" to 90", width of 24" to 44", and a thickness of 3/4" and greater. Assembly is an easy-to-do process and we include all the necessary hardware to get your desk frame put together and mounted to your desired desktop. • Built-in cable management rack stationed below the steel desk frame helps keep cords protected and organized. 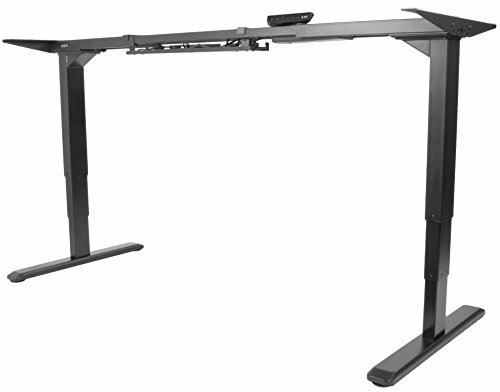 • Width: 40" to 68"
• Search for "MOUNT-PC01" our under desk PC mount. Perfect for height adjustable desk use to keep your power and AV cords from stretching and disconnecting.